Owning a Cast Iron Testubin Teapot is the epitome of authenticity when it comes to brewing your own Asian loose leaf tea. Originally used in the Japanese tea ceremony and dating back to the 17th century in Japan, these cast iron tea kettles have withstood the test of time. The healthful properties of Tetsubin teapots are said to vary according to the type of metals included in the cast iron pots, but the enriching minerals are thought to be released into the prepared tea through the brewing and steeping process. Tetsubin teapots are not only popular for healthful reasons, the stylish beauty of these cast iron pots make them very popular as a collectible. As you browse through the variety of styles that we offer you will be sure to find a Tetsubin teapot that suits your aesthetics. 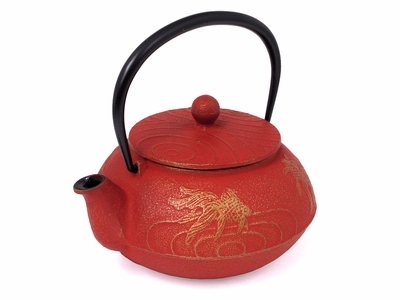 If you like modern lines, the bold red and black style of the Brushed Tetsubin Teapot might strike your fancy. The Green Dragonfly Testubin Teapot is just one of the more nature inspired styles that we carry as well. Don't be surprised if you want more than one Tetsubin teapot; Mrs. Lins Kitchen has searched far and wide to bring you the very best. As a gift for you or for a friend or family member; these Tetsubin Iron Teapots are durable treasures that will last a lifetime. If you like to learn more about the health benefit of Tetsubin Teapot, please read our newsletter here.